If you’re in the market for a new smart lock that looks great, works great, and is compatible with all the top smart home systems, you’ve come to the right place. 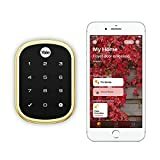 The Yale Assure Lock SL Key Free Touchscreen Deadbolt is by far our favorite smart lock. First of all, you don’t even have to use your smartphone when you don’t want to because there’s a nice big touchscreen keypad and support for 100 individual codes. But then you can also integrate it with your smart home system of choice, too. Versions are available for Siri/HomeKit and for Z-Wave, which works with all the popular systems like SmartThings and Wink. 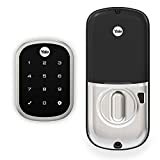 Plus, you get the comfort of knowing your smart lock was made by Yale, with is one of the oldest and most respected names in the business. The Yale Assure Lock SL is on sale right now on Amazon at its lowest price ever, so it’s the perfect time to upgrade.